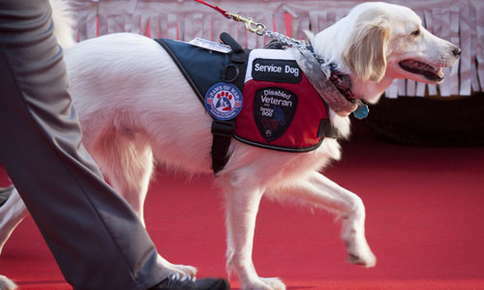 Service dogs help thousands of disabled Americans become more independent. The first service dogs guided visually impaired people, but today, the dogs assist people who have a variety of disabilities, ranging from hearing loss to seizures to cerebral palsy. Before a dog can become a service animal, it must complete an extensive training program that includes several components. During temperament screening, dogs are exposed to a variety of noises. Since these dogs must be able to assist their owners during thunderstorms or in other noisy situations, it's important that they do not cower in fear when they hear a loud noise. Trainers also test the dog's reaction to pain, as owner's never know when the dog will be accidentally bumped or jostled in public. Dogs that will make good service dogs may yelp if hurt, but will not run away or attack the person responsible for causing pain. Testers also evaluate how well prospective service dogs fetch. Although not all dogs will need to retrieve items for their owners, the test is also helpful in determining how easily a dog can be trained. Trainers not only train dogs to perform specific tasks but also expose them to a variety of situations their owners might experience, such as taking public transportation, shopping, riding in elevators, and crossing busy streets. How Do I Get a Service Dog? Many people get their service dogs from organizations that train the dogs for a year or two before turning them over to their new owners. Others obtain dogs and then work with an organization that trains both them and their dogs. Some people even train their service dogs themselves, although this method is much more likely to be successful if you have had significant experience training dogs. A dog's temperament and the type of work it will perform are more important than the breed. It's also crucial to consider the breed's average lifespan. Dogs that have longer lifespans are obviously a better choice. In addition to the emotional toll involved with a dog's death, training dogs with short lifespans means that a disabled person must adjust to working with a new dog multiple times throughout their lives. A breed may not be a good choice if a disabled person will not be able to handle its care or if it was bred for hunting or herding, as those traits may make training more difficult. Breeds that can be aggressive or territorial usually are not recommended for service dog work. What Is the Difference Between a Service Dog and an Emotional Support Animal? Service dogs perform tasks that disabled people cannot perform themselves, while emotional support animals offer support and comfort to people who suffer from mental health or emotional conditions. Unlike service dogs, emotional support animals do not usually receive any special training. Service dogs are considered medical equipment and can accompany their owners anywhere the public is normally allowed to go, according to the American with Disabilities Act. Emotional assistance animals are not given the same access under the law, although many businesses still allow owners to bring their animals with them. Whether your dog is a service dog or a cherished pet, regular veterinary examinations are essential to its good health. Call us today to schedule a checkup for your pet. "Dr. Savell has always gone above and beyond for the care of our family's pets for several years."